INDIANAPOLIS -- If you, like so many others, have been waiting for fall weather for weeks (or even months), you're in luck. Temperatures will drop into the 50s for at least the next week. Another piece of good news -- you should start seeing the beautiful fall colors on the leaves soon. Since temperatures have stayed so much warmer than an average fall day, the leaves have been reluctant to change. 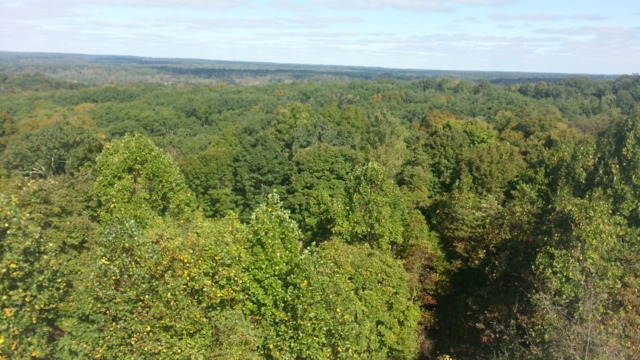 The best fall colors happen with bright, warm days, cool nights and moist soils, according to Carrie Tauscher, the DNR Division of Forestry’s Community & Urban Forestry program coordinator. Year after year, one of the best places in central Indiana to visit and see the fall colors is in Brown County. Before you make the journey to Brown County, you can even see what the leaves look like in real time, thanks to the Brown County Leaf Cam. For example, the Leaf Cam on Oct. 11 shows..... pretty green leaves. The reason leaves change colors in the fall is because of the pigments inside them. During spring and summer, chlorophyll is dominant. Chlorophyll is what makes the leaves green. In the fall, the other pigments become visible as the amount of chlorophyll dwindles. Tauscher also recommended Hoosiers mulch their fallen leaves instead of bagging them for a landfill. “It kills me when people throw all those good leaves to the curb,” she said.